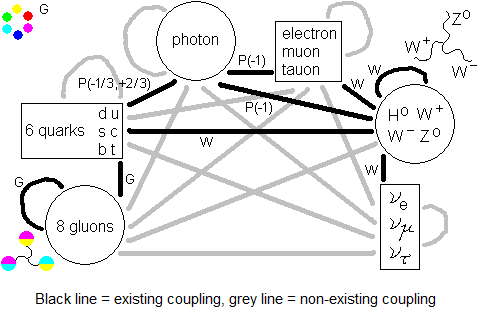 This storyline is about QCD, Quantum Chromo Dynamics or, if you like, Quantum Color Dynamics. As colorcharges we choose red , green and blue (the dark blue). As anticolors we take yellow , magenta and cyan . The three primary colors add up to colorless white. The three colors and the group of the three anticolors are equivalent. They are both equally fundamental. In fact each color is equivalent to any of the five others. Each color is as fundamental as each of the others. A color and its anticolor add up to white. In the colorcircle in the upper left corner of the figure, a color and its anticolor are always at opposite sites from the centre of the circle. which are the anticolors expressed in terms of colors only. The three secondary colors, the anticolors, add up to white too. which are the colors expressed in terms of anticolors only. So every color equals the sum of its two direct neighbours in the colorcircle. A proton consists of three quarks with the colors red , green and blue . A proton always can annihilate with an antiproton to solely gamma rays. A proton, an antiproton and a gamma ray are all white, so at first sight there seemed to be no problem. But there are colors in the proton and the antiproton and there are none in a photon. There is a need for annihilation of the colors and so, when the proton consists of colors, the antiproton has to consist of the anticolors antired , antigreen and antiblue . Quarks have color and antiquarks have anticolor. There seem to be no other way. In all experiments up until now it has been impossible to isolate a single quark. It has been impossible to achieve a coloured state in a particle, long enough to detect anywhere. One can’t have a single red quark, or a meson consisting of one red and one blue quark. As far as we can see now, coloured states don’t occur in nature. 1) The baryons. They consist of 3 quarks. These have the colors red, blue and green (r, b, g). 2) The antibaryons, consisting of 3 antiquarks with anticolors magenta, cyan and yellow (m, c, y). 3) The mesons. They consist of one quark and one antiquark, having a color and its anticolor ( and and ). The baryons + the mesons are called the hadrons. All these particles are white. So the always-present everything-overwhelming urge for color-neutrality - white - is accepted as a law of nature. If a reaction violates this rule this means the reaction will not take place. Or will be followed immediately by another reaction that restores a white color-state before observation can take place.